Welcome to my creative and inspired world. Besides being a mixed media artist, I am a spiritualist and therapist. And I strive to support fellow creative seekers discover how their art process can help them heal. In this class, you will be guided through gentle insight work via paper, pencils and pastel. The initial exercises help you open your heart chakra and prepare for exploration into our winged creature creative lessons. Once we move towards painting our messengers of spirit, I'll guide you towards a ritual that you can use daily to feel stronger and more grounded. Most of these lessons call for basic mixed media supplies such as liquid acrylic inks (I like Daler/Rowney), gesso, acrylic paints and ink pens (have a black and white pen). I purchase most of my supplies from Amazon or BlickArt. Mostly, thank you for taking the time for your heart and your art. Both are critical components for a creative and spiritually guided life. One last thing....have you ever felt intuitive? Guided by your gut instinct? Your inner voice that tells you what to choose or where to go? We are all intuitive beings. And this course will help you pay closer attention to that sixth sense that knows what's right for you (even as you create art)! Let's begin, beautiful ones. It's time to say hello to your heart. Before we begin our creative journey, I will guide you through two exercises which help illicit calm and peaceful 'trance' states. What is this? A way for your brain to stop over thinking and begin feeling grounded before you pick up your brushes. The benefit here is to teach your mind and body how to relax, let go of fear and anxiety, and start creating from your soul space. At the end of this exercise you'll feel calm, in control, and ready to start painting. How do you tap into something bigger than you? Something mystical and magical, that can be interpreted as "God energy" or "Spirit Guide" or "Source"? In this exercise, we'll create a connection to your guides using words and breath work, and something I call "the Easy Ask." This exercise will surely inspire you to create a messenger of spirit! Let's paint a beautiful winged creature to inspire hope and love. 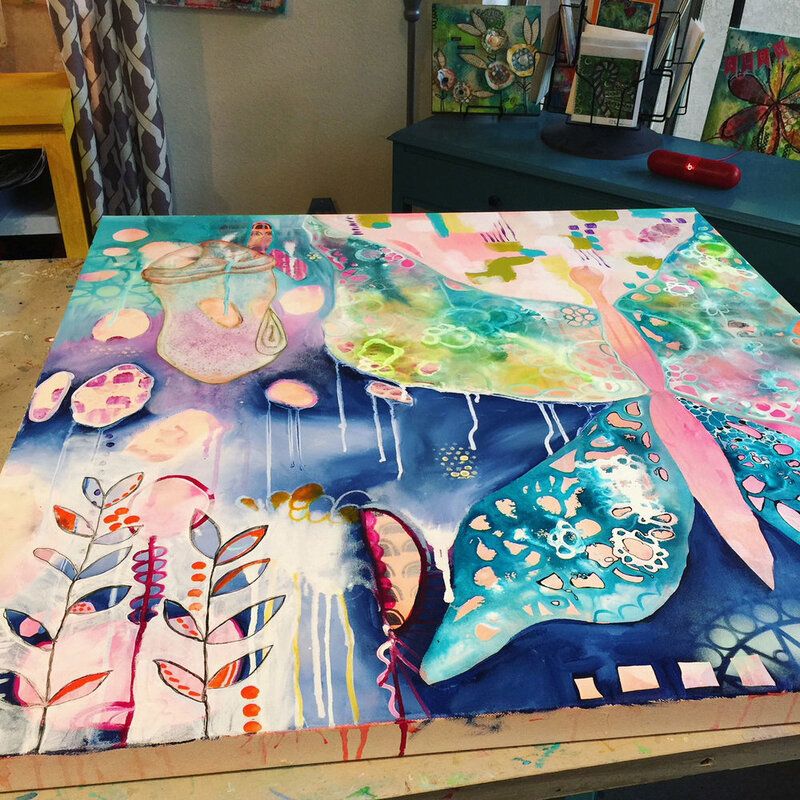 We will play with a variety of mixed media to layer color, pattern and texture! Infused with positive messages and abundant energy! My process is simple, fun and relaxing. The reward? An exciting creative journey and a gorgeous painting unique to you and your heart! You are going to adore creating your winged messenger! On a small canvas, I'll guide you through a fun hummingbird piece. Hummingbird, as spirit animal, teaches us all about the joys of living. And hummingbird asks that we we be more present, and more resilient, in our day to day life. They are also connected to the spiritual realm and used as "transporters" of our ancestor's energy once they've passed on (thus you may see hummingbirds often when you lose a loved one). This bonus lesson is all about blissful creating and gives us time to think about what we're grateful for....(so much)! A second small canvas, and this time, a big dose of the powerful spirit guide Butterfly! Butterflies are said to show up in our lives when we're ready for a transformation. His adaptability and joy bring us closer to the realms of magic....helping you feel free. Let's paint his magic in this second bonus lesson! Now that we've spent this beautiful time together, let's say goodbye with a blessing and a challenge to live your best, most spiritual/creative life. Embellishments you want to add are always welcome. Things like glitter, luminescent paints, etc. Denise is a certified hypnotherapist and intuitive clinician who supports adult and child clients as they overcome multitudes of blocks and symptoms. She enjoys traveling to teach art workshops across the US, and adores her small art studio in Atascadero, CA, where she lives with her husband, three daughters, 9 chickens, Chihuahua and 4 cats and 10 week old Golden Retriever puppy. Oh. And she enjoys playing the Ukulele. Find her on Facebook and Instagram as The Real Denise Braun.